The Pachycephalosaurus lived during the late Cretaceous period, about 76 to 65 million years ago, and is the only known species of the genus ‘pachycephalosaurid’. The reptile probably evolved from the small-sized Hypsilophodon, an agile, bipedal herbivore. The Pachycephalosaurus shared its environment with several other famous dinosaurs including Tyrannosaurus Rex, Ornithomimus, Torosaurus, Troodon, Stygimoloch, Ankylosaurus, and Triceratops. 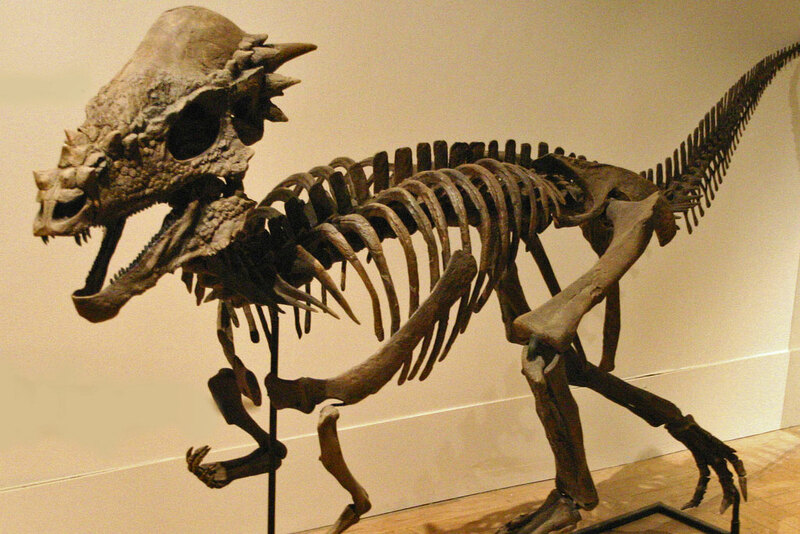 It was in 1859 that Ferdinand Vandiveer Hayden, a fossil collector, discovered the first holotype of the Pachycephalosaurus, consisting of a portion of the squamosal bone of the skull, near river Missouri that falls under the present-day Lance Formation. Since, during that time, the dinosaurs were not adequately defined, American paleontologist, parasitologist, and anatomist Joseph M. Leidy described the part of the head as a skin armor belonging to a reptile. He named the animal ‘Tylosteus’. Again, in 1930, a part of a skull was described by a well-known American paleontologist Charles Gilmore that was found from Wyoming’s Niobrara. Gilmore classified the species under genus ‘Troodon’, giving it the epithet ‘wyomingensis’. After more than a decade again, in 1943, American geologist and dinosaur hunter Erich Maren Schlaikjer and paleontologist Barnum Brown (commonly referred to as Mr. Bones) discovered newer specimens including partial skeletons and skulls. The discoveries were made from excavations conducted at the Hell Creek Formation site located in the Carter County of Montana, as well as from the Lance Formation site in South Dakota’s Corson County. The duo named the excavated fossilized specimens as Pachycephalosaurus grangeri and Pachycephalosaurus reinheimeri, respectively. The two scientists also reclassified Gilmore’s previously-obtained bones of Troodon in the same genus. 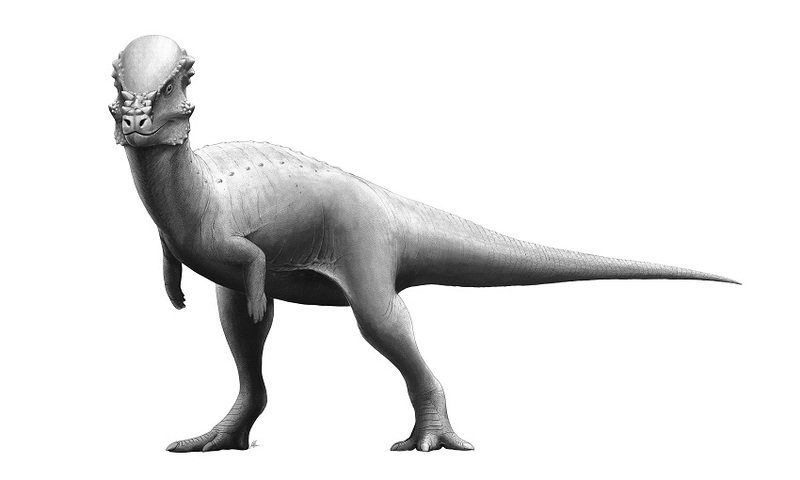 At present, the two species described by Schlaikjer and Brown are considered to be synonymous with the Pachycephalosaurus. However, it was paleontologist Donald Baird who noted the similarities between the fossil of Hayden’s ‘Tylosteus’ discovered back in 1859 and the two of the latter-day discoveries of the Pachycephalosaurus. 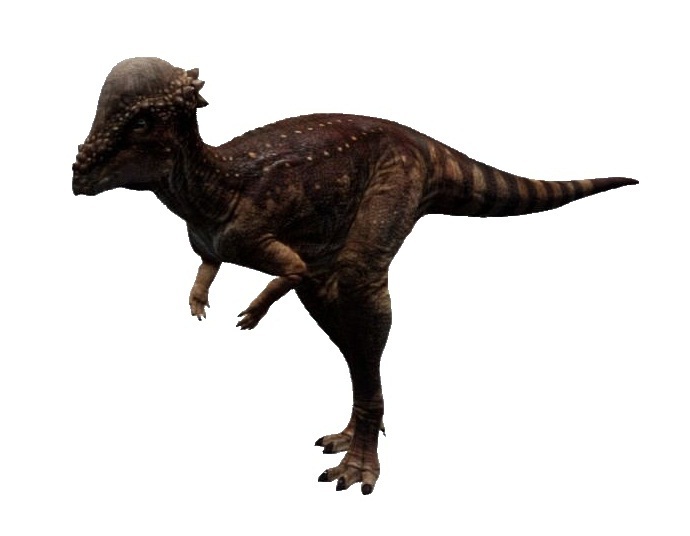 But because the genus Tylosteus was named earlier, the term ‘Pachycephalosaurus’ was considered as a junior synonym. Baird, however, made a petition to uphold the latter name because it was much widely known, while the former name was left unused for almost eight decades. Very little fossil evidence of the pachycephalosaurus has been discovered, which is not enough to confirm about its features or appearance conclusively. The pachycephalosaurus was a distant relative of the dinosaur family ceratopsid, but not to the theropod dinosaur Troodon, like it was initially thought. 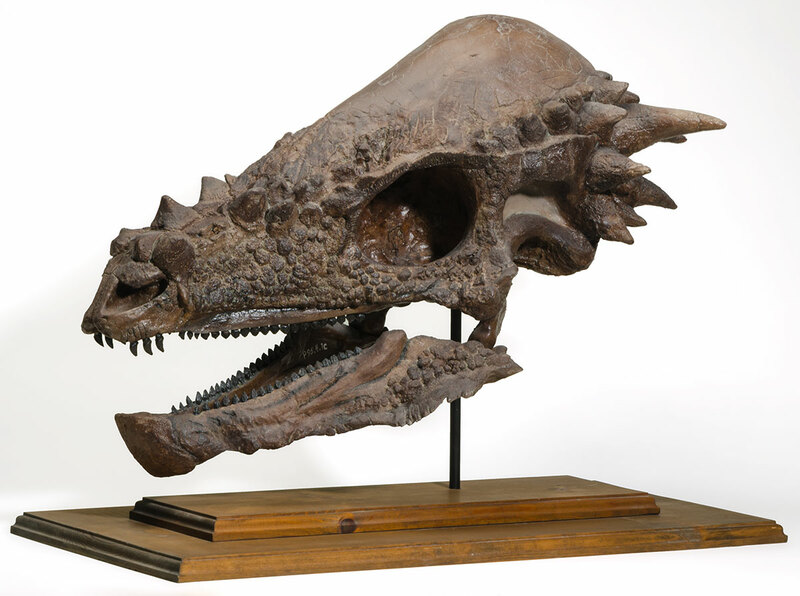 The skull dome of the pachycephalosaurus was its primary characteristic and was around 25 cm thick, made of temporal bones. However, it is thought that the excavated bones of the two genera belonged to baby dinos (and not adults), since the domes were not properly developed. Scientists also theorize that, as a means of defense or adaptation, this dome was composed of fibro-lamellar bones, and would heal from any wound very quickly. They were approximately 4 to 4.5 m in length, weighing around 1000 pounds. They had a small brain, and hence, were not too intelligent. The teeth were tiny but ridged and sharp, with a relatively small headset atop a short and mildly flexible neck. 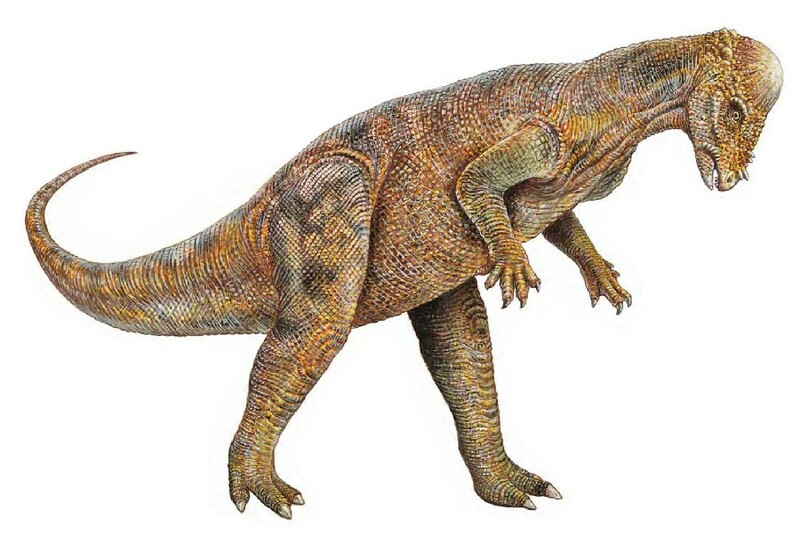 The pachycephalosaurus’ forelimbs were rather thin and small compared to the much longer hind legs. Like other pachycephalosaurids, their tails were probably stiff towards the base. These dinosaurs are thought to be social, herding dinosaurs, living mostly in small groups in and around the upland and the coastal regions with running being their primary way of self-defense (though their running speed was quite slow). It is also theorized that the large dome on the head of these reptilians were meant for ramming their enemies or predators when attacked, as well as their rivals during the mating season. They might also be an instrument to attract their mates. The feeding habits of these primitive animals have not yet been conclusively established. Paleontologists, however, believe that they were either an omnivore or an herbivore since none of the fossil evidence (unearthed to date) were enough to prove that they were purely meat eaters (carnivore). Their primary diet probably included soft plants, fruits, and seeds. 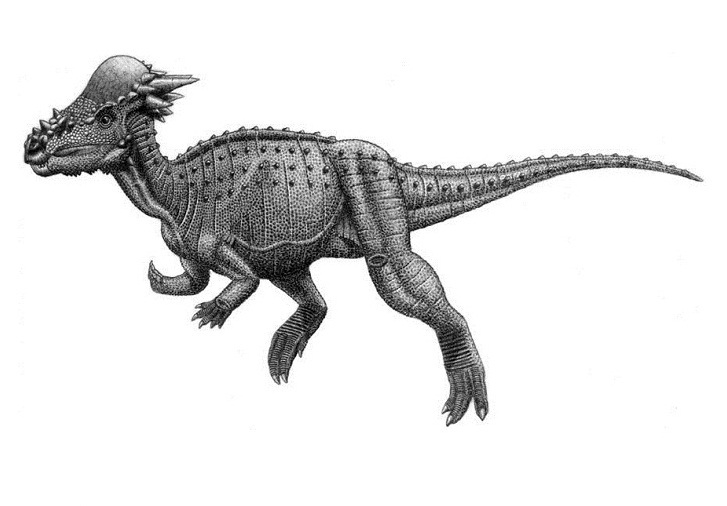 The name ‘pachycephalosaurus ‘ was derived from the Greek term ‘pachys’ (παχυς), which means ‘thick’, and ‘kephale’ (κεφαλη), which means ‘head’, and ‘sauros’ (σαυρος), meaning ‘lizard’. This dinosaur is the largest known pachycephalosaur. The reptile appeared in the 1997 Steven Spielberg movie ‘The Lost World: Jurassic Park’, where it was shown stampeding with the other species of dinosaurs, and also in the 2015 sequel ‘Jurassic World’, where it escaped its enclosure and was tranquilized to sleep. 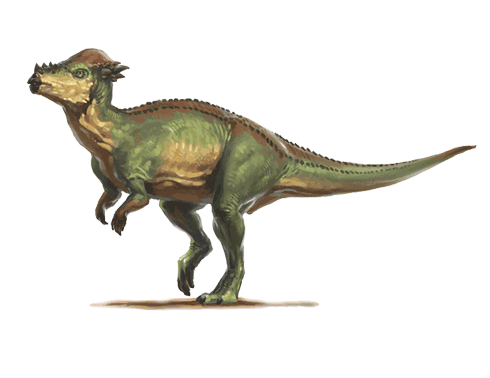 The Pachycephalosaurus will appear in ‘Jurassic World: Evolution’, based on the same design as the ‘Lost World’. Published on August 28th 2018 by admin under Reptiles. Article was last reviewed on 21st December 2018.